Across many industries and implementations, we see some recurring themes pop up in those use cases. In past podcasts we’ve talked about chatbots, autonomous vehicles, and aspects of natural language understanding, computer vision, and advanced robotics. 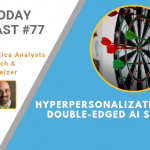 In today’s AI podcast we want to talk about the concept of hypersonalization, a particular use case that’s applicable across a wide range of industries, but advertising in particular.